Climate change is happening now and local governments must play a significant role in reducing emissions and helping people cope with the impacts. Austin has existing climate commitments and has made progress in expanding its use of renewable energy, but many challenges remain. 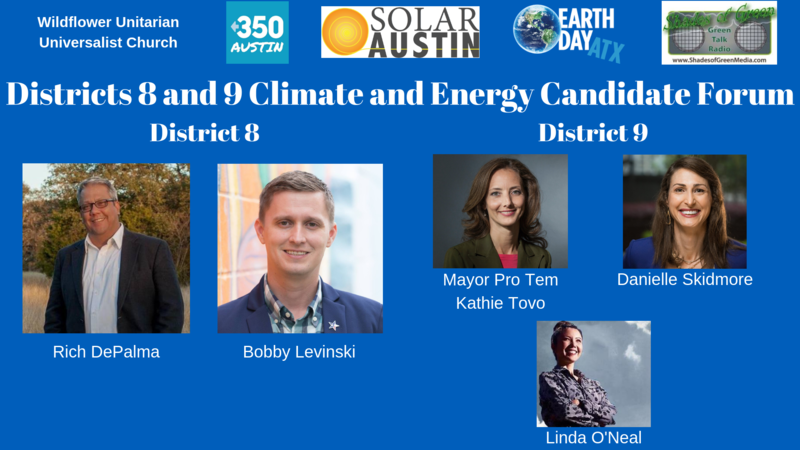 Solar Austin, 350 Austin, Earth Day Austin, Shades of Green, and the Wildflower Unitarian Universalist Church are hosting a forum for mayoral candidates to speak to Austinites about their climate change and energy priorities. Please join us to hear from Bobby Levinski and Rich DePalma from district 8 and Mayor Pro Tem Kathie Tovo, Danielle Skidmore, and Linda O'Neal from district 9. We will have prepared questions and will accept questions from the audience. Candidates are required to respond to a written questionnaire in order to participate and those responses will be posted here when we get them.